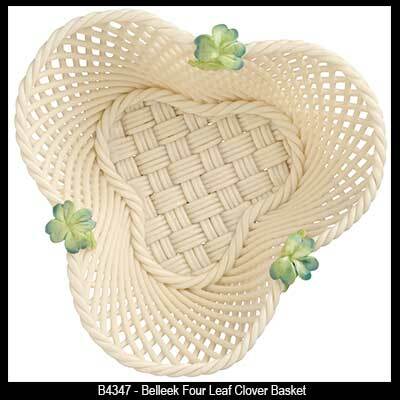 The Belleek China Four Leaf Clover Basket was Introduced in 2016. This Belleek basket features both a four leaf clover and shamrocks. This Irish basket is woven of fine china with individually applied leaves. The Belleek China basket measures 4" wide x 2 1/2” deep and it is hand painted and handmade in Belleek, Ireland. The Belleek four leaf clover basket is received gift boxed with a shamrock history card, complements of The Irish Gift House. The Belleek four leaf clover basket features hand painted shamrocks and a clover.